Robot, a self-governing, programmable electromechanical device used in industry and in scientific research to perform a task or a limited repertory of tasks. Robots are a subcategory of automated devices. Although no generally recognised criteria exists that distinguishes them from other automated systems, robots tend to be more versatile and adaptable (or reprogrammable) than less sophisticated devices. They offer the advantages of being able to perform more quickly, cheaply, and accurately than humans in conducting set routines. They are capable of operating in locations or under conditions hazardous to human health, ranging from areas of the factory floor to the ocean depths and outer space. The concept of robots dates back to ancient times, when some myths told of mechanical beings brought to life. Such so-called automata also appeared in the clockwork figures of mediaeval churches, and in the 18th century some clock makers gained fame for the intricately clever mechanical figures that they constructed. Today the term automation is usually applied to these handcrafted, mechanical (rather than electromechanical) devices that are restricted merely to imitating the motions of living creatures. Some of the “robots” used in advertising and entertainment are actually mere automata, even with the addition of remote radio control. The term robot itself is derived from the Czech word robota, meaning “compulsory labour”. It was first used in the 1921 play R.U.R. (which stands for “Rossum’s Universal Robots”) by the Czech novelist and playwright Karel Capek, to describe a mechanical device that looks like a human but, lacking human sensibility, can perform only automatic, mechanical operations. In the play, however, the robots proved much more capable than that, eventually conquering and destroying their makers. The term android is now generally reserved for human like figures of this sort, ranging from electromechanical robots in human form to human like creatures made entirely of biological materials. Robots as they are known today are not really imitative of human or other living forms except in the limited aspect of digital dexterity. The roots of their development lie in the effort to automate some or all of the operations required on the factory floor. This effort began in the 18th century in the textile industry, when some looms were designed to perform under the control of punched paper tapes. With the burgeoning of the Industrial Revolution, more factories sought to bring a greater degree of automation to the repeated processes of the assembly line. True robots did not become possible, however, until the invention of the computer in the 1940s and the progressive miniaturization of computer parts. One of the first true robots was an experimental model called Shakey, designed by researchers at the Stanford Research Institute in the late 1960s. It was capable of arranging blocks into stacks through the use of a television camera as a visual sensor, processing this information in a small computer. Thereafter engineers tried to adapt robot like devices to useful tasks. In the mid-1970s, General Motors financed a development program in which Massachusetts Institute of Technology researcher Victor Scheinman (1942-) expanded upon a motor-driven “arm” he had invented to produce a so-called “programmable universal manipulator for assembly”, or Puma. The Pumas that resulted mark the beginning of the age of robots. Autonomous Robots today are equipped with a small microprocessor or microprocessors that can handle the data being fed them by various sensors of the surrounding environment. Making use of the principle of feedback, robots can then change their operations to some degree in response to changes in that environment. The commercial use of robots is spreading, with the increasing automation of factories, and they have long since become essential to many laboratory procedures. Japan is in the forefront of nations exploring robot technology. Whether the androids of science fiction will ever become a reality is not yet possible to predict, because duplication of even such seemingly simple acts as bipedal walking has proved enormously difficult. The question of “intelligent” androids must similarly be left to the future of artificial intelligence as a whole. At this time Japan has employed Autonomous humanoid robots in schools as they are considered to be less “critical” than human teachers. many are now used in hospitals to work with the elderly as they are very patient and don’t get frustrated. In the meantime, however, robots should continue to expand their applications and who knows, the next major breakthrough in robot technology may just be as a result of your curiosity. A more complete chronology of the development of Robotics can be found here. “Personal Robotics” describes an area of technology which is currently in it’s infancy, though is is developing at a rapidly increasing pace. It is an exciting and interesting pseudo-technology where individuals create machines which can do some pre-defined task or sequence of tasks. 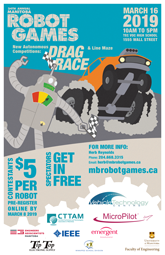 The mandate of the Science Council Manitoba is to encourage interest in science and technology, and the Manitoba Robot Games is one activity that can encourage this through the medium of personal robotics. It is intended that each year we shall promote and organize a competition which allows robot designers of all ages and skill levels to showcase, demonstrate, and compete for prizes. Our competitions are carefully chosen or created by members of the Science Council Manitoba Planning Group to be visually interesting and challenging to many levels of expertise and some are compatible with other competitions throughout the world. As we head towards the twenty first century it is clear that employers are seeking individuals that are clever, resourceful, competitive and self motivated! The Science Council Manitoba provides an entertaining and challenging proving ground for these individuals in the form of our annual Robot Games. You are interested in science and technology, not just in getting a job, and are willing to expand your knowledge through extra-curricular activities! You have good mechanical aptitude. This is something that is not as readily demonstrated by your standard courses, but a skill that is important to many potential employers. You are capable of starting a project and seeing it through to completion. This project is entirely self-motivated (i.e. No instructor is pushing and prodding you through it! ) so this demonstrates to a potential employer that you can persevere and get the job done with a minimum of supervision. You can become involved in the growing international movement of robotic games. You can learn to choose team members and work as a group to identify and solve problems, undertake research and development exercises. The most obvious reason to participate? Because IT IS FUN! The robotic competitions that have occurred in other provinces and states have invoked awe, excitement, longing, encouragement, and sometimes, hysterical laughter from large audiences during the entire events. Participants will carry happy memories of the contest for years to come! Now, let’s get onto the real subject at hand, How do I build a robot?? First let’s look at the resources you have available to you! Your Teachers! Many instructors are enthusiastic toward helping their students undertake robotic projects, and are a wealth of information. Some innovative instructors even give credit in various courses for work done on the robots. Your fellow students! The old axiom, “Two heads are better than one” is quite true, but if you can assemble a good team, you may be able to draw strengths from each to benefit the whole group. Industrial Experts! There are numerous people in industry that may be willing to answer your questions or sponsor your team perhaps with information or materials. Your team should actively solicit companies for spare parts, toys, motors, gears, and any useful hardware they can donate. Experts On-Line! The internet is an incredible source of information and expert advise. Your school librarian should be able to help you out in that department. What Materials could you use to construct your robot? There are several ways to build a robot. It might be built from scratch, using raw materials and innovation! It could be re-constructed by heavily modifying an existing toy. While this might appear to be simpler, it may well restrict the shape/strength/speed of your final robot. Lastly you could buy a robot kit where the engineering is pre-done for you. Let’s examine these options. LEGO. Don’t Laugh! LEGO has a high strength to weight ratio and is quite versatile. Strength of the final design could be improved by glueing the components together using Cyano-Acrylate a.k.a. Crazy Glue. MECCANO is another very strong, light material, ideally suited to chassis applications. METALS. Available in sheet form and profiles, metals are relatively easy to cut and shape, but remember Tin Plate, Copper, Brasses and some Steels will solder together well but Aluminum and Titanium must be screwed, bolted or riveted. Should you choose a sheet metal as a medium, try building a prototype robot from an empty cereal box and tape first. Once the design is established, use the cardboard as a template to layout and cut the sheet metal. DUCT TAPE is very useful for connecting parts with surprising strength and ease. (There is a saying that goes “pretty is nice, but UGLY works better!”) The 1993 winner of the Western Canadian Sumo Robot Games in Alberta used Duct Tape extensively with good results! WOOD, in the form of thin ,1/8″ plywood (aircraft ply from hobby shops) and dowels would be relatively easy to shape, cut and glue. MOTORS are best salvaged from VCR’s, copy machines, large toys, printers, etc. There are quantities of motors of various types in Princess Auto’s Salvage department. BATTERIES should have a relatively high energy density and quick recharge. Top of the list in rechargeables here is Lithium ion (Li). Gelcells and Ni-Cads work well since they have a high surge current capacity, but lantern batteries (6v) could also work but Gelcells and Lantern batteries are both heavy. Surplus stores like Princess Auto usually have a selection of quite cheap surplus rechargeable batteries. Lead-Acid batteries should not be used as they may leak if not kept upright. DRIVE COMPONENTS such as Gears, Belts, Pulleys, Shafts, etc. are abundant in the same places that you will find the motors. If you choose to modify an existing remote control toy as the platform for your robot, you already have a drive train, control and battery system to work with, and can save considerable time in construction. If you are looking for an RC vehicle, you might consider reading the ads in various classified sections of newspapers and “Bargain Finders” for inexpensive RC cars. The hobby stores around town might point you to local RC clubs which are often a great resource for like minded people. When you start to plan your robot, it is best not to shoot for the moon in your first effort! Rather to develop a framework to support the motors first, connect them to a simple hand controller. Add wheels and batteries then evaluate. If you have enough power adequate speed, and good control,then it is time to consider the body. From now on remember to evaluate after each improvement. Many prospective competitors have failed to enter a robot because they had set their goals too high and over complicated things too much or underestimated the time needed to build, evaluate, improve, evaluate, rebuilt, etc.. When the basic robot is done, spend the remaining weeks on improvements and modifications. Without the pressures of competition deadlines, you can slowly polish and improve your robot by adding that JPDS (JELLO projectile delivery system) or extra battle armour! There are a great many kits available. Some in local hobby stores, but most are available from online stores such as Solarbotics or Pololu. Some kits are designed to do only one task, one way, and are very difficult to modify, so beware! Skill level required to build it. Perhaps more importantly, what is NOT included in the kit but which is necessary to complete the project to the way you want it. Are special tools, cables, software, processors needed? An efficient machine that utilises mechanical parts, is built with one aim: To ensure that exactly the right amount of force, produces just the right amount of movement, to just the right point in space, at just the right velocity, at just the right time. Mechanical machines exist to convert one form of energy or movement into another. Reciprocal (back and forth) to circular or vice-versa, or to adjust ratios such as distance/force (pulleys and levers) or speed/torque (gears). You can only get as much energy out of a machine as you put into it in the first place – no more and no less. As a motor or muscles move to supply force to a machine they give it energy; more force or more movement provides more energy. Movement is a particular form of energy called kinetic energy. It is produced by converting other forms of energy, such as the potential energy stored in a spring, the heat energy in a gasoline engine, the electric energy in an electric motor, or the chemical energy in muscles or a battery. The principle of conservation of energy governs all actions. Springs may store energy, and friction will convert energy to heat, but when everything is taken into account, no energy is created and none destroyed. What does that mean to you, a robot builder? Define your problem statements carefully and explore as many alternatives as possible. Choose mechanisms wisely to keep the number of moving parts to a minimum. Keep friction to a minimum. Use appropriate bearing materials and lubrication. Heat is inevitable, be sure to transport it away as quickly as possible. Check out these physical ideas on the net or in the library. Chances are you will be using most of them in your robot so refresh your memory and use them to your advantage – examples are in (brackets). This section, “Simple Machines and other Physical Concepts”, was derived in part from David Macaulay’s excellent book & interactive CD Rom, “The Way Things Work”. Check it out, it’s a fun way to explore the basic principles and concepts needed to build a super robot.